We are adding more cultural presenters. Are you, or do you know, someone who was born and raised in a country other than the United States? Find out about becoming a Cultural Presenter. D. Identify services performed by the local, state and national governments. E. Identify positions of authority at school and in local, state and national governments. K. Identify different ways people govern themselves. B. Recognize that the world is divided into various political units. C. Identify ways in which countries interact with the United States. E. Identify how nations work together to solve problems. B. Know that environmental conditions influence where and how people live. • Identify how regional natural resources influence what people use. • Explain the influence of climate on how and where people live. A. Listen to others. Ask questions as an aid to understanding. E. Participate in small and large group discussions and presentations. D. Identify how conflict and cooperation among social groups and organizations affected world history. B. Identify and locate places and regions. A. Identify the physical characteristics of places and regions. B. Identify the basic physical processes that affect the physical characteristics of places and regions. A. Identify the human characteristics of places and regions by their population characteristics. B. Identify the human characteristics of places and regions by their cultural characteristics. C. Identify the human characteristics of places and regions by their settlement characteristics. We reserve the right to add a $25 fee for hosts who do not follow the guidelines of the contract, i.e. not sending the deposit beforehand, not paying the balance in full on the day of the event, and/or requiring significant additional paperwork. Sing your way around the world with our 45-minute interactive show, featuring fun songs, intriguing instruments, and much more from 12 countries, featuring musicians Todd and Merci Brill and their family. The Kids and Cultures World Music Tour is a quick trip around the world with songs from Mexico, Jamaica, Lesser Antilles, Peru, Brazil, Africa, Israel, Greece, France, Poland, Russia, India, China, Australia, and the United States. _Our newest show, Big Dreams Big Deeds, features interactive stories of kids around the world doing big things to help their families, communities, and the world. In 45 minutes, you'll "meet" kids making a big difference! When his town (in Malawi, Africa) was suffering from a drought, William went to his library, researched inventions, and built his own windmill to bring water and electricity to his neighborhood. With friends, Severn (from Canada, North America), started an organization to protect nature, and spoke to the United Nations about the responsibility we all have in taking care of the people, plants, and animals that share this planet. In the middle of war in his country (Kosovo, Europe), Petrit and a friend started a club to bring together children from different ethnic backgrounds to work and play. These stories, and more, include information about what it's like to grow up in these countries and inspiration to read, dream, and make a positive impact on the world around us, no matter how young or old we are. Timm and Kristina Wenger have announced two significant changes to the organization they founded eight years ago. Kids and Cultures began in 2003 as a non-profit educational organization to introduce children to world cultures. The board voted in February 2011 to authorize the conversion of the organization to a for-profit corporation which will be run by the Wengers. In addition to the structural change, the Wengers are also rolling out a new plan to involve more partners, including international presenters and presentation facilitators, in their programs. They are developing a network of storytellers, musicians, and other performers who will be available for schools and other groups. "Since the beginning, we have desired for Kids and Cultures to grow beyond what our family can do," says Timm. "These two changes will bring the flexibility and connections for the programs to expand." Meet our presenters. The Wengers thank the board members and volunteers who have served throughout the years to enable Kids and Cultures to introduce children to world cultures. During the week of June 23 to 27, 2014, children will explore the world with stories, music, crafts, games, snacks, and guests from other countries and cultures. 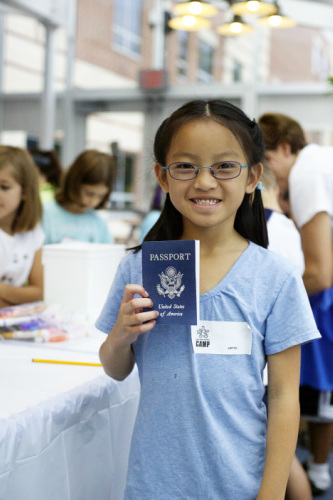 Kids and Cultures Camp will be held at Lancaster Country Day School, Lancaster, Pa.
Campers will "visit" a different country each day, create their own travel scrapbooks, and receive a Kids and Cultures Camp T-shirt. "Destinations" this year include Egypt, Haiti, Venezuela, Hawaii, and India. Find more information. Check out photos and videos from previous years. Find booking information, including our special introductory rate for this show, and details about our other presentations. Thursday, November 14, 6:30 p.m. Kids and Cultures World Tour: Philippines, with guest presenter Dr. Joy Tien. Join us for an interactive presentation about what it’s like to grow up in the Philippines, featuring stories, a game, a craft, and more. Register at http://knc-philippines-eorg.eventbrite.com/. Hui-Ling Singer is a World Tour presenter. The fourth grade social studies curriculum in the School District of Lancaster, Pa., is a study of world cultures, with a focus on four regions of the world--Africa, Asia, Europe, and Central/South America. Last year, Ross Elementary teachers Svetlana Shubinsky and Kelly Wood wanted to take their students beyond the typical book learning and research. They sought and received a grant from the Lancaster Foundation for Educational Enrichment (LFEE) to invite Kids and Cultures to facilitate six interactive sessions this past spring as part of the new Kids and Cultures World Tour program. Four of the sessions featured guest presenters who were born and grew up in other countries, and now live in the Lancaster area. The presenters told about their home countries; led a hands-on activity, such as a game or craft; shared a folktale, song, or dance; and answered students' questions. "This face-to-face interaction with people from all over the globe will not only enrich the academic knowledge of the students, but will enable them to appreciate the richness of other cultures that's right here in our own country," says Timm Wenger, coordinator of the program. In addition to thinking globally, the students also developed their own cultural profile. The teachers also asked Kids and Cultures to coordinate their end-of-year field trip to correspond with the program. At the end of the World Tour series, students took a field trip to Embassy Row in Washington, D.C., to visit three embassies and a cultural restaurant. For more information about the World Tour program or Embassy Row Tours, please contact us. During the past three years, more than 1,000 participants have walked and sampled food from around the world in the Kids and Cultures Taste the World experience. 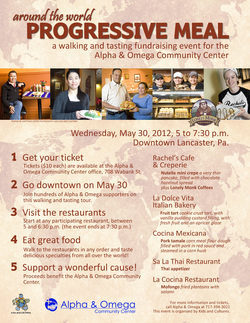 On May 30, Kids and Cultures, along with local restaurants, gave back to Lancaster by organizing a similar event as a fundraiser for the Alpha & Omega Community Center, Lancaster, Pa.
More than 200 participated in this walking and sampling tour and received a taste of France, Italy, Mexico, Thailand, and the Dominican Republic, and raised $970 for the community center. Find the details at www.progressivemeals.com. Book One, Get One Free! Special offer, valid through October 22, 2012 [now extended through November 12]. Kids and Cultures has launched a new interactive storytelling show, Big Dreams Big Deeds. The show features stories of kids around the world doing big things to help their families, communities, and the world. Big Dreams Big Deeds complements the libraries' 2012 Summer Reading Program theme of Dream Big - Read! by introducing children and their families to kids from around the world who use their imaginations, creativity, and ideas to make a positive impact on those around them. Ask your youth librarian to book Big Dreams Big Deeds. Get ready to Snack Around the World! You and a friend are in for a treat--18 of them, to be exact! 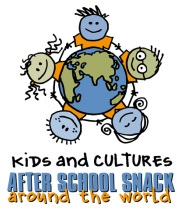 Kids and Cultures has launched a new program in which children and adults can "Snack Around the World" after school. Participants will receive a coupon book for nine cultural restaurants in Lancaster, Pa. At each location, they can redeem a coupon for two free snacks, plus take advantage of discounts on menu items. In addition, there will be educational components available for participants to learn a bit about the countries represented by the restaurants. Coupon books are available at a discount for non-profit organizations, schools, scouts, churches, and other groups to sell as a fundraiser. Your group can earn $3 for each book you sell! The participating restaurants are: Addisu Ethiopian Restaurant, Cocina Mexicana, El Maizal Colombian Restaurant, La Cocina Restaurant, La Dolce Vita Italian Courthouse Bakery, Manna Restaurant, Rachel's Cafe & Creperie, Spyro Gyros, and Sukothai Restaurant. 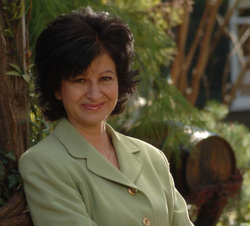 Tuesday, March 13, 7:00 to 8:00 p.m., Kids and Cultures World Tour: Iraq, with special guest Mina Omar. Join us for an interactive presentation about what it's like to grow up in Iraq, featuring stories, a craft, a game, and more. For school-age children, their families, and any others interested in developing cultural awareness and understanding. Harrisburg Area Community College, Lancaster Campus. Registration is required. Tuesday, March 20, 7:00 to 8:00 p.m., Kids and Cultures World Tour: Romania, with guest presenter Lenuta Lowery. Join us for an interactive presentation about what it's like to grow up in Romania, featuring stories, a craft, a game, and more. For school-age children, their families, and any others interested in developing cultural awareness and understanding. Harrisburg Area Community College, Lancaster Campus. Registration is required. Tuesday, March 27, 7:00 to 8:00 p.m., Kids and Cultures World Tour: Venezuela, with guest presenter Jose Urdaneta. Join us for an interactive presentation about what it's like to grow up in Venezuela, featuring stories, a craft, a game, and more. For school-age children, their families, and any others interested in developing cultural awareness and understanding. Harrisburg Area Community College, Lancaster Campus. Registration is required. Kids and Cultures Camp: 5 Days, 5 Countries! Hui-Ling Singer shares about Chinese culture. We've experienced a week of stories, music, crafts, games, snacks, and guests from other countries! Kids and Cultures Camp was held the week of June 20 to 24 at Linden Hall, Lititz, Pa. Campers "visited" a different country each day, created their own travel scrapbooks, and received a Kids and Cultures Camp T-shirt. The sessions this year featured guests from China, Cyprus, South Africa, Cuba, and Afghanistan. Check out photos and videos from this week (and previous years). Meet our presenters. "My name is Ghulam Alizada. I was born in Kabul, Afghanistan, and went to school there; war and instability pushed me out of my country. I graduated in civil engineering at the University of Azerbaijan and moved to the United States in 2003. I am married and work with American Testing Laboratories. I love traveling to different countries and enjoying different cultures and foods. I also love to play sports like soccer, frisbee, and volleyball." Merci Brill was born in Cuba and raised there until age 8, when she was sent to Puerto Rico as part of the Peter Pan project, with the purpose of escaping Communist indoctrination. In Puerto Rico, she studied, married, and worked as a college professor. Merci moved to Lancaster, Pa., 22 years ago. She and her husband (a musician and educator) have three sons. Her passion is teaching math and playing music. She teaches Spanish part time for a living, homeschools, and sporadically is involved in music performances, like birthdays, weddings or special occasions. She like to work on craft projects that include various media. Merci enjoys talking about her Cuban childhood versus the Puerto Rican one, and can speak about both cultures in English or Spanish. She plays guitar and sings, and has a music repertoire of Hispanic children's music and adult cultural versions. 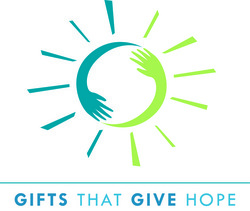 Merci has presented and volunteered for Kids and Cultures since 2008. John Protopapas was born and raised in South Africa. He traveled all over the country, before leaving to travel to Greece, and then India, at age 20. He lived in Greece about three years, and traveled and studied classical Indian music while living extensively in India. John has been immersed in classical Indian music for over 25 years. John teaches yoga at his studio in York, Pa. (www.yogahomepa.com) and teaches a world music course at York College. He loves sharing his travels, leading drum circles, and performing music on the sitar for anyone with a passion for learning. John has two children--a daughter who is immersed in the world of music through her singing and violin, and a son who is an 8th grader, who is "total fun to be around." John says that they both bring tons of joy and creativity into the world. John was a presenter at Kids and Cultures Camp 2007 (South Africa) and 2008 (India). We will have several guests with us to help us learn about Iraq, led by Mina Omar. Mina has helped with Kids and Cultures Camp since 2010. Lenuta Lowery is from Romania. She now lives in Lancaster with her husband and son. 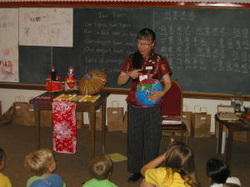 Mrs. Lowery has presented for the Kids and Cultures World Tour since 2011. Select this option if you paid the deposit on March 16 or after, and now wish to pay the balance. Due by May 16, 2011. Select this option only if you paid the deposit by March 15, and now wish to pay the balance. Due by May 16, 2011. Here's a list of our events that are open to the public. Thursday, September 29, 7:00 to 8:00 p.m., Kids and Cultures World Tour: Ethiopia, with guest presenter Almaz Yillala. Join us for an interactive presentation about what it's like to grow up in Ethiopia, featuring stories, a craft, and more. For school-age children, their families, and any others interested in developing cultural awareness and understanding. Harrisburg Area Community College, Lancaster Campus. Registration is required. Thursday, October 6, 7:00 to 8:00 p.m., Kids and Cultures World Tour: India, with guest presenters Santosh and Sukeshi Iyer. Join us for an interactive presentation about what it's like to grow up in India, featuring stories, music, a craft, and more. For school-age children, their families, and any others interested in developing cultural awareness and understanding. Harrisburg Area Community College, Lancaster Campus. Registration is required. Thursday, October 13, 7:00 to 8:00 p.m., Kids and Cultures World Tour: China, with guest presenter Hui-Ling Singer. Join us for an interactive presentation about what it's like to grow up in China, featuring stories, a game, a craft, and more. For school-age children, their families, and any others interested in developing cultural awareness and understanding. Harrisburg Area Community College, Lancaster Campus. Registration is required. Thursday, October 20, 7:00 to 8:00 p.m., Kids and Cultures World Tour: Sweden, with guest presenter Anton Öberg. Join us for an interactive presentation about what it's like to grow up in Sweden, featuring stories, music, a craft, and more. For school-age children, their families, and any others interested in developing cultural awareness and understanding. Harrisburg Area Community College, Lancaster Campus. Registration is required. Thursday, October 27, 7:00 to 8:00 p.m., Kids and Cultures World Tour: Egypt, with guest presenter Yassmine Amin. Join us for an interactive presentation about what it's like to grow up in Egypt, featuring stories, a craft, and more. For school-age children, their families, and any others interested in developing cultural awareness and understanding. Harrisburg Area Community College, Lancaster Campus. Registration is required. Wednesday, December 7, 6:30 p.m., Celebrate! World Holidays for Kids. Just in time for the holiday season, Kids and Cultures returns with a 45-minute interactive multicultural presentation packed with festive folktales, facts, and fun! Lancaster Public Library, 125 N. Duke St., Lancaster, Pa.
Just in time for the holiday season, Kids and Cultures returns with Celebrate! World Holidays for Kids, a 45-minute interactive multicultural presentation packed with festive folktales, facts, and fun! 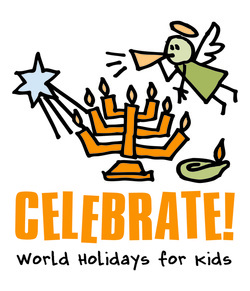 Learn about special days that children around the world celebrate. The show, perfect for school assemblies or company holiday gatherings, is offered for a limited time from mid-November to the end of December. Book this show by October 31 and receive $200 off per performance! Kids and Cultures is pleased to announce that Sheri Brooks is joining the team as a facilitator for the World Tour program, which you can catch at the Lancaster Public Library this summer (see our Events page for details). Sheri is no stranger to Kids and Cultures. 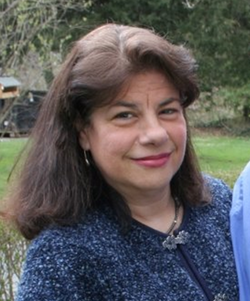 She is the co-founder of Kids and Cultures Camp, and co-directed the Camp during the years it was held at Millersville International House. She lived in Lithuania for many years, and now is the owner of Fluency Connection, an English Language Learning and Accent Reduction service. Share your heart and home! Host an exchange student. September 29th - October 1st @ The Lancaster Host Resort's Expo Center. Monday, June 27, 10:30 a.m., Treasures of the World, at Jarrettsville Branch Library, Jarrettsville, Md. Tuesday, June 28, 2 p.m., Treasures of the World, at Aberdeen Branch Library, Aberdeen, Md. Tuesday, June 28, 6:30 p.m., Treasures of the World, at Bel Air Branch Library, Bel Air, Md. Thursday, June 30, 1:30 p.m., Kids and Cultures World Tour: Egypt, with Yassmine Amin, at Lancaster Public Library (contact the library to register). Sponsored by Lancaster Radiology Associates, www.lancasterrad.com. Tuesday, July 12, 6:30 p.m. - Kids and Cultures World Tour: India, with guest presenters Santosh and Sukeshi Iyer, at Lancaster Public Library (contact the library to register). Sponsored by Sam S. Smucker & Sons, Inc., www.sssmucker.com. 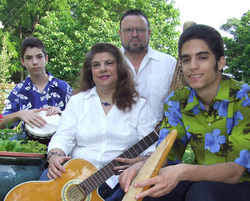 Wednesday, July 13, 10:30 a.m. - Kids and Cultures World Music Tour concert, with Todd and Merci Brill, James V. Brown Library, 19 East 4th Street, Williamsport, Pa. (contact the library to register). Thursday, July 14, 6:30 p.m. - Kids and Cultures World Tour: Cuba, with guest presenter Merci Brill, at Lancaster Public Library (contact the library to register). 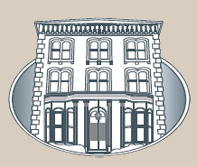 Sponsored by Dr. Matt Freedman, providing comprehensive dentistry for adults and children (www.lancasterdentist.com). Wednesday, July 20, 10:30 a.m. - Kids and Cultures World Tour: Cuba, with guest presenter Merci Brill, James V. Brown Library, 19 East 4th Street, Williamsport, Pa. (contact the library to register). Wednesday, July 27, 10:30 a.m. - Kids and Cultures World Tour: Venezuela, with guest presenter Jose Urdaneta, James V. Brown Library, 19 East 4th Street, Williamsport, Pa. (contact the library to register). Thursday, July 28, 1:30 p.m., Kids and Cultures World Tour: Ecuador, with Charito Calvachi-Mateyko, at Lancaster Public Library (contact the library to register). Sponsored by Executive Coach Inc., a family owned and operated group charter transportation company providing quality services for 35 years throughout the US and Canada. When you travel with Executive, you receive “peace of mind.” Learn more at www.executivecoach.net. Wednesday, August 3, 1:30 p.m. - Kids and Cultures World Tour: China, with guest presenter Hui-Ling Singer, James V. Brown Library, 19 East 4th Street, Williamsport, Pa. (contact the library to register). Friday, August 5, 7 p.m. - Kids and Cultures World Music Tour, with Todd and Merci Brill, at the Worship Center's World Fair, Leola, Pa. See www.worshipcenter.org/worldfair for details. Thursday, August 11, 1:30 p.m., Kids and Cultures World Tour: China, with Hui-Ling Singer, at Lancaster Public Library (contact the library to register). Sponsored by WeeUsables Children's Consignment Event, September 29th - October 1st @ The Lancaster Host Resort's Expo Center, www.weeusablesevent.com. Thursday, August 18, 1:00 p.m. (please note early start time), Kids and Cultures World Tour: Sweden, with Anton Oberg, at Lancaster Public Library (contact the library to register). 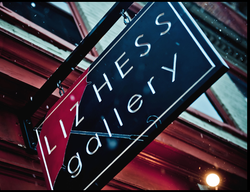 Sponsored by Liz Hess, painter of the Red Umbrella Collection, www.lizhess.com. Kids and Cultures World Tour series, Thursday evenings from September 1 to November 3, location to be determined. The featured destinations are Ecuador, Egypt, Venezuela, China, India, Cuba, the Philippines, El Salvador, Ethiopia, and Sweden. Check back for details. These events are subject to change. 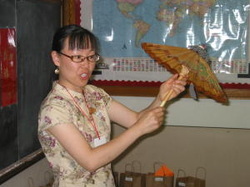 Thursday, September 1, 7:00 p.m., Kids and Cultures World Tour: China, with guest presenter Hui-Ling Singer. Join us for an interactive presentation about what it's like to grow up in China, featuring stories, a game, a craft, and more. For school-age children, their families, and any others interested in developing cultural awareness and understanding. Thursday, September 8, 7:00 p.m., Kids and Cultures World Tour: Ecuador, with guest presenter Charito Calvachi-Mateyko. Join us for an interactive presentation about what it's like to grow up in Ecuador, featuring stories, music, a craft, and more. For school-age children, their families, and any others interested in developing cultural awareness and understanding. Thursday, September 15, 7:00 p.m., Kids and Cultures World Tour: Venezuela, with guest presenter Jose Urdaneta. Join us for an interactive presentation about what it's like to grow up in Venezuela, featuring stories, music, a craft, and more. For school-age children, their families, and any others interested in developing cultural awareness and understanding. Thursday, September 22, 7:00 p.m., Kids and Cultures World Tour: Egypt, with guest presenter Yassmine Amin. Join us for an interactive presentation about what it's like to grow up in Egypt, featuring stories, a craft, and more. For school-age children, their families, and any others interested in developing cultural awareness and understanding. Thursday, September 29, 7:00 p.m., Kids and Cultures World Tour: Ethiopia, with guest presenter Almaz Yillala. Join us for an interactive presentation about what it's like to grow up in Ethiopia, featuring stories, a craft, and more. For school-age children, their families, and any others interested in developing cultural awareness and understanding. Thursday, October 6, 7:00 p.m., Kids and Cultures World Tour: India, with guest presenters Santosh and Sukeshi Iyer. Join us for an interactive presentation about what it's like to grow up in India, featuring stories, music, a craft, and more. For school-age children, their families, and any others interested in developing cultural awareness and understanding. Thursday, October 13, 7:00 p.m.,- Kids and Cultures World Tour: Cuba, with guest presenter Merci Brill. Join us for an interactive presentation about what it's like to grow up in Cuba, featuring stories, music, a craft, and more. For school-age children, their families, and any others interested in developing cultural awareness and understanding. Thursday, October 20, 7:00 p.m., Kids and Cultures World Tour: Sweden, with guest presenter Anton Öberg. Join us for an interactive presentation about what it's like to grow up in Sweden, featuring stories, music, a craft, and more. For school-age children, their families, and any others interested in developing cultural awareness and understanding. Thursday, October 27, 7:00 p.m., Kids and Cultures World Tour: El Salvador, with guest presenter Daisy Detwiler. Join us for an interactive presentation about what it's like to grow up in El Salvador, featuring stories, a craft, and more. For school-age children, their families, and any others interested in developing cultural awareness and understanding. Thursday, November 3, 7:00 p.m., Kids and Cultures World Tour: Philippines, with guest presenter Dr. Joy Garcia Tien. Join us for an interactive presentation about what it's like to grow up in the Philippines, featuring stories, a craft, and more. For school-age children, their families, and any others interested in developing cultural awareness and understanding. Take a walk downtown...around the world! Join us for our fifth Taste the World walking and sampling tour, to be held Friday, May 13, 5 to 8 p.m.
Where else can you try authentic Indian chicken tikka and vegetable pakoras, Italian cream puffs, Jamaican paddies with coconut rice and beans, a French-inspired crepe, a Moscow panini, Turkish coffee and a dessert, Asian crab rangoon, Mexican tamales all at one meal? Visit our new Taste the World website for details. Timm and Kristina Wenger have announced two significant changes to the organization they founded eight years ago. 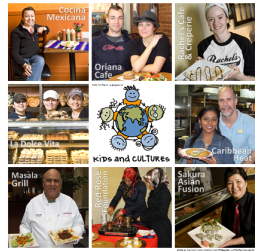 Kids and Cultures began in 2003 as a non-profit educational organization to introduce children to world cultures. The board voted in February to authorize the conversion of the organization to a for-profit corporation which will be run by the Wengers. Plans for this year include the eighth annual Kids and Cultures Camp, to be held June 20 to 24, the return of the Taste the World walking and sampling tours in Lancaster, Pa., and the launch of the Kids and Cultures World Tour program. The fourth grade social studies curriculum in the School District of Lancaster, Pa., is a study of world cultures, with a focus on four regions of the world--Africa, Asia, Europe, and Central/South America. This year, Ross Elementary teachers Svetlana Shubinsky and Kelly Wood wanted to take their students beyond the typical book learning and research. They sought and received a grant from the Lancaster Foundation for Educational Enrichment (LFEE) to invite Kids and Cultures to facilitate six interactive sessions this spring as part of the new Kids and Cultures World Tour program. Four of the sessions will feature guest presenters who were born and grew up in other countries, and now live in the Lancaster area. The presenters will tell about their home countries; lead a hands-on activity, such as a game or craft; share a folktale, song, or dance; and answer students' questions. "This face-to-face interaction with people from all over the globe will not only enrich the academic knowledge of the students, but will enable them to appreciate the richness of other cultures that's right here in our own county," says Timm Wenger, coordinator of the program. In addition to thinking globally, the students will also develop their own cultural profile. The teachers also asked Kids and Cultures to coordinate their end-of-year field trip to correspond with the program. At the end of the World Tour series, students will take a field trip to Embassy Row in Washington, D.C., to visit three embassies and a cultural restaurant. For more information about the World Tour program or Embassy Row Tours, please contact us. Join the Red Rose Foundation on Saturday, February 19, 7 to 9 p.m., for their monthly Traditional Turkish Coffee Night. In addition to coffee, snacks, and a demonstrating artist, the event will also feature the Wenger family of Kids and Cultures, who will tell about their trip to Turkey in 2007, which is the focus of the kids documentary Really Big Field Trip Turkey. The Coffee Night is open to the public. For more information, visit Red Rose Foundation.